For flat surfaces without forests, the relationship between SCF and SWE (fig. 2) was derived by using satellite-based and ground-based observations. On one hand, the remote sensing data are used for estimating SCF, since SCF cannot be obtained in areas comparable to the size of GCM grid cells from ground observations. On the other hand, ground observations are used for SWE, since from satellites, snow depth and density cannot be measured. As both satellite- and ground-based observations are involved, the equation which applies only for non-forested areas for the following reasons: (i) Satellite-based observations of SCF are not well defined in forested areas due to masking of snow on the ground below the canopy and, (ii) ground observation are rare in densely forested regions such as the boreal forests. where ps is the density of snow. 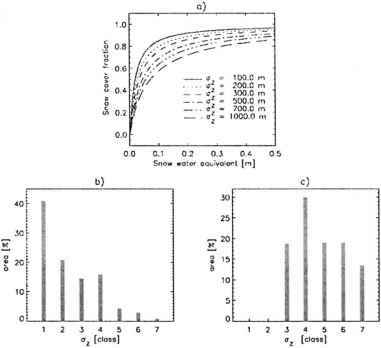 Following Verseghy (1991), snow density does not exceed 450 kgm~3, but remains constant for Sn > 0.623 m. Equation 5 accounts only for changes in snow density due to mechanical compaction but neglects metamorphism. 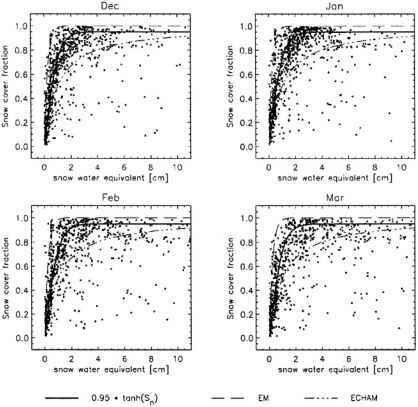 Temperature induced metamorphism leads to significant density changes at the end of the snow season. Therefore, Eq. 5 probably underestimates the snow density in spring since the density increases as the snow cover melts. However, Robock et al. (1995) validated Eq. 5 using daily observed values of snow depth and SWE at six Russian stations between 1978 - 1983. In the second step, SWE obtained with Eq. 5 from the USAF snow depth climatology (Section 3) was transformed onto the T106 grid (1.1° resolution) by using an area-weighted interpolation. The error introduced by interpolation is negligible as the old and new mesh have similar resolution. 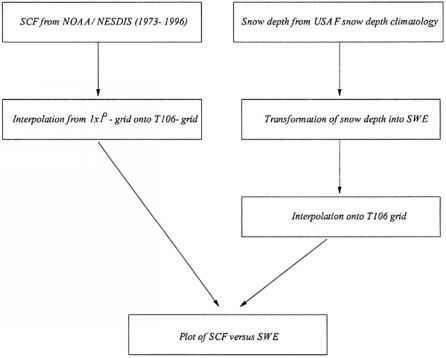 In the third step, a global snow cover climatology grid was compiled on the T106 grid from the NOAA/NESDIS data (Section 3). This compilation involved the calculation of a frequency of occurrence from the weekly present/absent data and an area-weighted interpolation onto the T106 model grid. In the fourth step, the SCF was plotted as a function of the SWE in Fig. 3. Data measured in regions with forests and mountains were excluded using data from grid-cells with less than 10% forest cover (as compiled by Claussen et al., 1994) and a standard deviation of the sub-grid scale orography smaller 300 m. The few data measured in Greenland and Antarctica are not considered. Further investigations including the roughness length for vegetation (z0,veg) as a new independent variable in the parameterization of SCF led to no further improvement in the parameterization. This might be partly due to large uncertainties and inaccuracies in determining the roughness lengths for GCM grid boxes. In addition, it is hazardous to use grid-mean roughness lengths rather than computing roughness lengths separately over each vegetation type within a grid-cell. From Fig. 3, it is evident that the original parameterization in ECHAM4 substantially underestimates the snow cover fraction in flat, non-forested grid boxes, while the parameterization used in the "Europa-Modell" is an upper envelope of the point cloud displayed in Fig. 3. Both old parameterizations are a poor description of the relationship between SCF and SWE for flat surfaces without forests. These results are in line with the findings of Yang et al. (1997). They argued, based on measurements of daily mean surface albedo and snow depth by Baker et al. (1991), that there are two distinct stages in the relationship between surface albedo and snow albedo. In the first stage, albedo rapidly increases with increasing SDH until it reaches a critical depth. 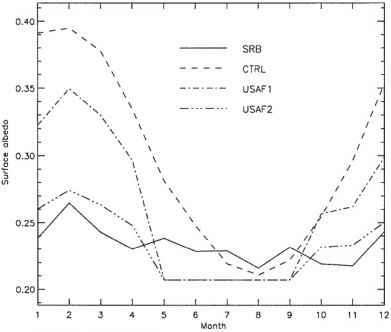 For larger SDHs, during the second stage, the surface albedo increases minimally as SDH increases. They emphasize that the tanh-form pertains to grasslands and agricultural lands, where vegetation slumps under the snow burden. where S„ = 0.01 m. Eq. 7 accounts for snow patches remaining on the northern slopes of the mountains, whereas the slopes exposed to solar radiation are snow free during the melt period. In addition, on steep mountains, the bare rock can be exposed on account of snow sliding, even during winters with heavy snowfall. This might markedly reduce the SCF and thus surface albedo. Fig. 5a displays how SCF is significantly reduced over rough mountainous regions. The SCF is about 70% over steep mountains (ctz > 1000m) for Sn = 0.2 m, compared to more than 90% over flat land areas. The calculation of az is based on a global digital elevation model, compiled by the U.S. Geological Survey's EROS data center in Sioux Falls, South Dakota (Bliss and Olson, 1996). The horizontal grid spacing is 30-arc-seconds (which corresponds to about 1 km). This global height distribution dataset provides a resolution ten times better than the US Navy dataset with a resolution of 5' x 5', as used in the ECHAM4. A 1-km-resolution is better adapted for resolving the characteristic dimension of valleys and the steepness of mountain slopes which are relevant to processes such as snow sliding and snow melt. Figures 5b and 5c show the distribution of az for all land grid points and the Himalayan area, respectively. The classes '1' to '7' embrace the following ranges for az: class 1: az<100m; class 2: 100m< cz <200m; class 3: 200m <ctz <300m; class4: 300m <az < 500m; class 5: 500m <ctz <700m; class 6: 700m <ctz < 1000m; class 7: ctz > 1000m. More than 50% of the Himalayas is covered with grid boxes with az >500m at T42 resolution. 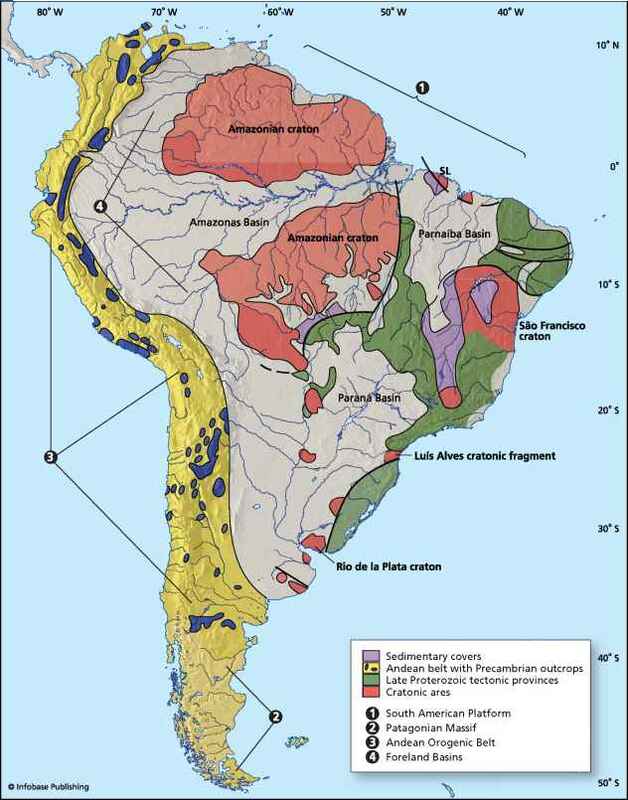 Approximately 25% of the Earth's land surface has a standard deviation of the subgrid orography larger than 300 m at T42 resolution, thereby pointing out the relevance of incorporating ctz. In addition, these regions are mostly in mountainous (and, therefore, higher and colder) areas that are usually snow covered during winter.